This year, I’m going to celebrate my son-in-law and therefore my grandkids Polish heritage by talking about Paczki. 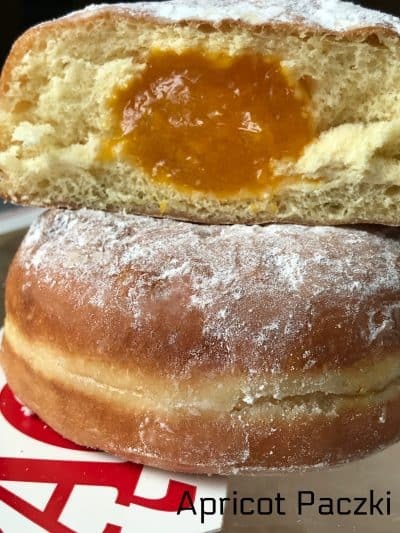 Mardi Gras might get all the attention this time of year but for people with Polish roots, Fat Tuesday is celebrated with a traditional Polish doughnut known as a Paczek. Paczki are Polish doughnuts, that are filled with jelly or a sweet fruit filling. 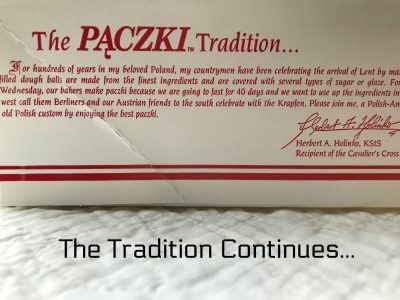 Paczki are similar to German, Jewish, and Italian filled doughnuts but traditional paczki contain a splash of Polish vodka called Spiritus in addition to the flour, eggs, milk, sugar, yeast, and sometimes butter that make up the dough. The excerpt below comes from the side of the box that my four apricot filled Paczki came in. This was the first time that I have ever eaten or purchased Paczki and it will certainly not be my last. I can certainly understand what all the hoopla is all about! Paczki are delicious and I would stand in line too, to get my hands on some more of these yummy doughnuts. 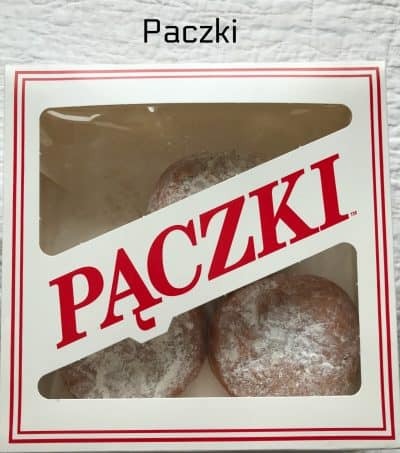 I can only imagine what they taste like warm from the bakery oven….I bought my Paczki at my local grocery store for only $2.99 for four Paczki. I guess I’m going to have to go back to the store and buy me some more! In Polish culture, Pączki Day (Punch-key) is a once-a-year event and is only celebrated on Fat Tuesday, the day before Ash Wednesday. People will ask for pączkis not realizing that pączki is already the plural of pączek (Punch-ek). Pączki are very rich donuts, deep fried and then filled with fruit or cream filling and covered with powdered sugar or icing. Traditionally, Lent was 40 days of fasting; meaning one meal a day and full fasting on Friday. Any rich foods were not allowed. The Tuesday before lent, people of Poland used up food so that it would not be spoiled or wasted. Families would use up their eggs, butter and sugar and fruit by treating themselves one last time before Lent began with these rich donuts. In the United States, Paczki Day was always popular in the Polish communities from the beginning of the 20th century. Polish immigrants settled in different parts of the U.S., such as Detroit, Baltimore, Grand Rapids, Saginaw, Chicago, Buffalo and especially Hamtramck MI, where the Polish bakeries would have Pączki for sale on Fat Tuesday morning. In smaller communities it was the local Polish Parish that came together to make and sell Pączki. 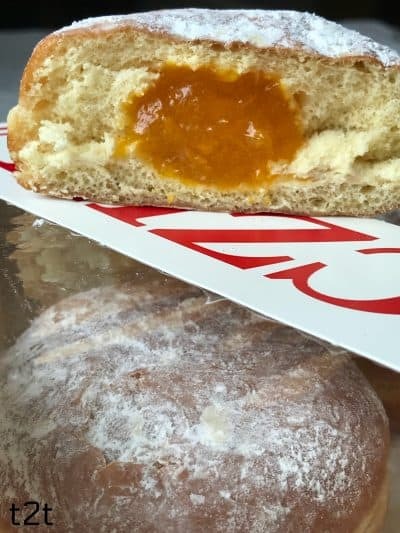 Paczki can be found up to a month before Fat Tuesday in almost every food store. People just can’t pass up a delicious food holiday and Pączki Day can be considered one of the best. In Polish-heavy Midwestern cities like Detroit, Cleveland, Green Bay, and Chicago, Fat Tuesday is known as Paczki Day. During the holiday, local bakeries sell tens of thousands of fresh pastries in the morning, with people lining up around the block to get them. There are also parades, eating contests and a lot of naps. Paczki are known to draw lines around the block this time of year. 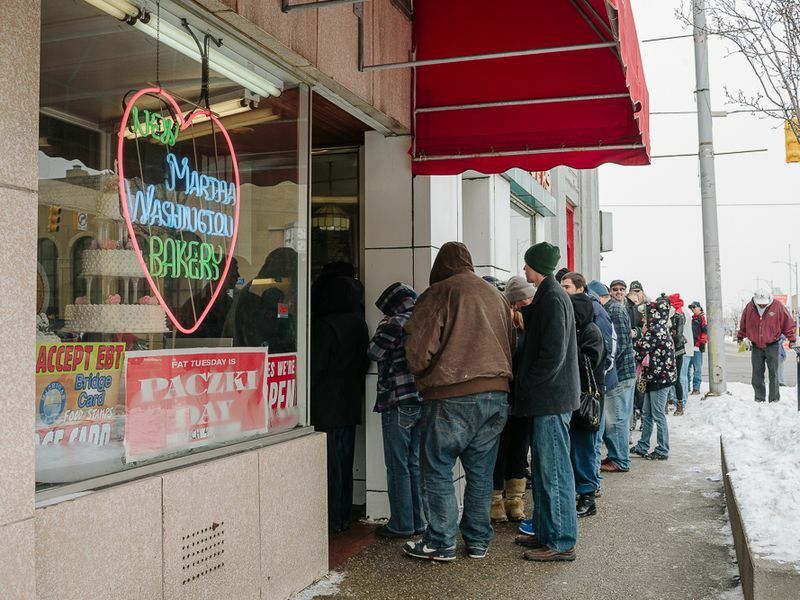 So what are you waiting for….go get in line so you can get yourself a Paczki!